John N. Cobb, founder of the University of Washington College of Fisheries, was a photographer in his own right. He specialized in the documentation of fisheries in the United States, especially those in Alaska and the Pacific Coast. 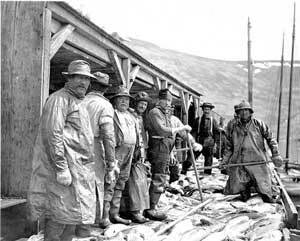 Among the photographs included in this digital collection are images of salmon, halibut and cod fisheries along the West Coast, whaling activities in Alaska, clamming and oystering industries in Washington, and images reflecting the first 6 or 7 years of the University of Washington College of Fisheries. Also included are photos of cities and landscapes from Cobb's travels. John N.Cobb was born in 1868. After finishing high school, he did not pursue any further formal education. In the late 1880s, he worked as a newspaper reporter and editor. From 1895 to 1904, he worked for the US Bureau of Fisheries, authoring various publications. As he gained experience in the field, his work improved and his reputation began to spread. Cobb furthered his career when in 1904 he accepted a job as the Assistant Agent of the Salmon Fisheries of Alaska. From 1913 to 1917 he served as editor of the Pacific Fisherman, a journal published in Seattle. In 1917, Cobb became Assistant General Superintendent of the Alaska Packers Association, a job he held until 1919. In the 1910s, Cobb began to encourage the University of Washington to establish the first fisheries college in the U.S. When the University opened the school in 1919, Cobb was asked to be its director. Given that Cobb had not even earned a Bachelor's degree, his appointment was somewhat unusual and reflected his remarkable reputation and achievements. During Cobb's tenure as Director of the College of Fisheries, he continued to publish and enhance his reputation in the field. In 1921 and 1923 he served as president of the Pacific Fisheries Society. In January 1930, Cobb died of a heart attack in California at the age of 61. His photography collection consists mainly of images relating to the fishing industry from all parts of the world. Images selected for digitization include documentation of salmon, halibut and cod fisheries in Alaska and Washington, rare photographs of whaling activities off the coast of Alaska, clamming and oystering industries in Washington, and images reflecting the first 6 or 7 years of the University of Washington College of Fisheries. Also included are photos of cities and landscapes from Cobb's travels. Best known as a leading authority on fisheries and for initiating and directing the University of Washington fisheries program, John Cobb was a fisheries biologist, author and editor, federal official, and college professor. Cobb became a leader in his field and received a number of commissions to investigate fisheries along the Atlantic coast, Great Lakes and the Pacific coast. Most of Cobb's work, however, was in the Pacific Northwest and Alaska. Aside from his development of the UW fisheries program, some of Cobb's most noteworthy contributions were inventions to allow salmon to overcome modern barriers such as fishways. The information for John N. Cobb Photographs was researched and prepared by the UW Libraries Special Collections and Cataloging staff in 2000. Not all the photographs from the collection were included in this database: the database consists of 340 digital images chosen from a larger group of photographic prints. The images were scanned in grayscale using a Microtek Scanmaker 9600L and saved in .jpg format. Some manipulation of the images was done to present the clearest possible digital image. The scanned images were then linked with descriptive data using the UW CONTENT program. The original collection resides in the UW Libraries Special Collections Division as the John N. Cobb Collection no. 418.